Through the Firestop Specialty Contractor Program, Hilti trains professional contractors in fire protection systems installation procedures of Hilti firestop products that meet all current standards and codes. For Architects and Specifiers this is great news. By using a Hilti Accredited Firestop Specialty Contractor (HAFSC) you get factory-trained professionals who are knowledgeable about firestopping methods and quality installations. 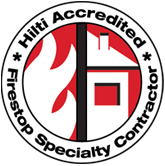 ​A Hilti Accredited Firestop Specialty Contractor (HAFSC) is an independent professional firestop installer who has been provided specialized training by Hilti; and who has committed to provide building owners, general contractors, and subcontractors with a full service solution for all their firestopping needs. When you choose to use a Hilti Accredited FSC, you are selecting a trained firestop installation specialist committed to applying proven Hilti firestopping technology and innovation in your building to minimize the risk of loss due to fire, smoke, and toxic gases. Hilti Accredited FSCs use Hilti firestop products, which eliminates the confusion caused by numerous subcontractors installing different firestop products on the same job. This also provides continuity throughout the job, which helps reduce your liability exposure. Their professional expertise in installing the appropriate Hilti firestop system can provide significant savings potential in time and cost to the general contractor and building owner. During firestop inspections, Hilti Accredited FSCs can offer documented, step-by-step accountability. Their firestop expertise helps assure building officials that the proper installation techniques have been applied and that all installed firestop systems comply with local and national codes.